You know this has happened to you: You've got dinner guests arriving in a few hours, and your plan for dessert, well, OK, you have no plan for dessert. What should you do? Call a friend? Make a run to the nearest supermarket? Get them drunk so that they forget about dessert? Like a souffle, these custard cakes rise like balloons. Fortunately, unlike a souffle, they hold their shape well after being removed from the oven, so they still look pretty an hour or two later. When you nudge your spoon into the ramekin, you'll discover a fluffy, cakey layer on top supported by a pudding-like custard on bottom. The sugar and whipped eggs whites balance the tart lemon making them refreshingly tangy. The cakes taste best at room temperature or just slightly chilled. As for garnish, a light dusting of confectioner's sugar is all they need. Though if you want to channel Martha, you should top the cakes with a few fresh berries or a mint sprig. Just don't dip the mint in gold. That's overkill. Here is the recipe for Martha Stewart's Lemon Custard Cakes. Unusual for me, I didn't do much tweaking to the original recipe. I merely coated the ramekins with cooking spray instead of butter, used Meyer lemons instead of regular lemons, and added more lemon zest, about 3-4 teaspoons. Otherwise, I followed it exactly. I only got 5 servings instead of 6, but that will vary depending on the size of the ramekins you use. Jeff and I enjoyed them so much, that I also made an orange version with juicy California navel oranges. Whether you use lemons or oranges, these custard cakes taste like a light and breezy spring day, just what most of us need in cold and stormy March. Isa's Recipe for Vegan Lemon Bars recipe at Wasabimon! I have never tried a 'custard' cake, but like you, I have run to Martha MANY times. This looks so refreshing and perfect for Spring! I love those kind of desserts! A wonderful idea. Yummy! This is what my family calls 'lemon pudding cake' and was a favorite in my mother's repertoire when 'supper was a little skimpy'. They seem so 'elegant' when done in ramekins, Mom never thought of that! Martha is definitely a good person to turn to when you're in need of dessert help. These look great! I love how these sound so nice and light. Thanks for sharing! I have a bag of great-tasting lemons I got as a gift, so I deeply appreciate the suggestion. I may have to make these this weekend! They sound like the perfect way to use up a few extra meyer lemons. Thank you for the link out! Perfect sweet treat for spring! They sound amazing Susan and perfect in a pinch because we would most likely have the ingredients on hand. these look delicious! Great post! 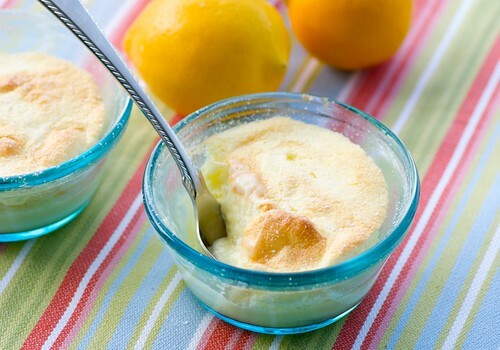 I love a lemon pudding and self saucers are the best. People think you are terribly clever - and yet they are effortlessly easy. Thanks Martha - thanks to you for sharing it. Yum! Awesome recipe, and I imagine these are such a pleasant end to a meal. And just to think that I couldn't find another simple idea to deal with the lemon invasion in my kitchen! Thanks for point me the light, Susan! I mean the cake. ;) Can't wait to try these! This is one of my favorite desserts. I remember having them when I was growing up -- in a mix from Jello. As Alanna says, they were called "lemon pudding cakes." There was a chocolate version as well as lemon. I don't think it was as fudgy as molten lava cakes. ha, ha, ha, "get them drunk"! that would not help me, for the ones who usually want dessert are my g-babies! 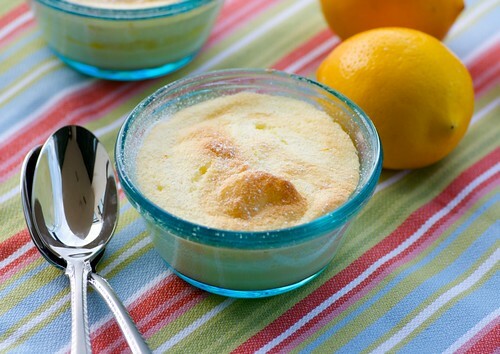 i have to try these...i sooo love lemon, and the babies would love having their own little dish of dessert! I love lemon desserts, and the orange version sounds great too! Great to know they keep their shape. Ha Ha. I just made these the other day. In fact, this recipe was what made me break my no desserts like sweets over lent vow. yeah..... They were good though. Very nice lemon flavor. This custard cake is irresistible! You can never get enough quick fix desserts Susan, loving this one. Thanks! Can you help me out with the dish-towel lined baking dish? Of course you remove the dish towel before you add the boiling water and bake? I just don't understand the dish towel part......thanks!